Shockingly, after a half a year of virtually no news whatsoever, last month was actually newsworthy in the world of presidential job approval polling. Barack Obama had a good month, and hit a noteworthy milestone in the percent of Americans who approve of the job he's doing. One note for clarification -- while we know that the rest of the political universe is currently focused on the "horserace" polls this close to an election, what we're discussing here is not Barack Obama's standing with Mitt Romney, but instead whether those surveyed approved of the job Obama is currently doing. An important distinction. 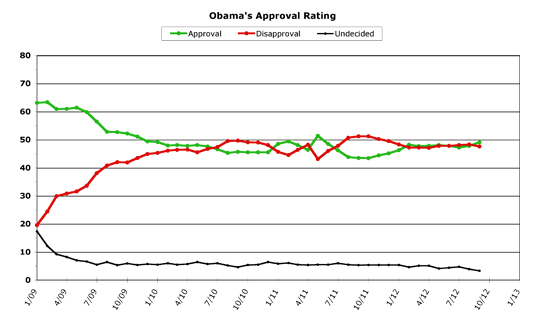 Even on this graph, a strong uptick is visible for Obama. September began with three big political events which coincided with Obama's rise in the polls. First, there was the Democratic National Convention. Then, the unemployment rate went down from 8.3 to 8.1 percent. Soon after, the tape of Mitt Romney disavowing the "47 percent" went public. Obama charted a strong "convention bounce" in his horserace polling, and this effect spilled over onto his job performance numbers as well. It also may have influenced a rise in Americans' confidence about the future, which I addressed in an earlier column. Convention bounces are always seen as suspect, due to them often melting away soon afterwards, but consider the fact that it's been a full month since the Democratic National Convention got underway -- and Obama seems to still have retained his rise in the polling. Obama's monthly average job approval rose by 1.3 percent this month, the second-largest gain he's charted this year. 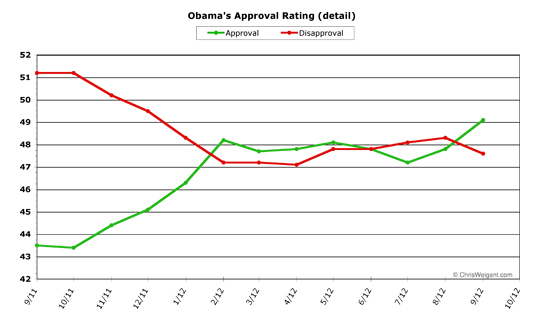 Obama finished the month with a 49.1 percent approval rate overall. Obama's monthly disapproval average fell 0.7 percent to finish up at 47.6 percent. For the first time in three months, this puts Obama "above water" once again, with a 1.5 percent positive gap -- better than he's managed since last summer. 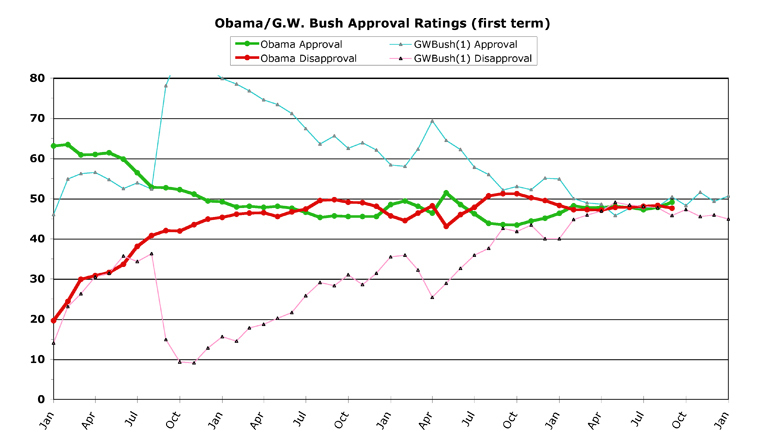 Obama's overall numbers hit a few highs this month that are notable. Barack Obama has only logged monthly average approval numbers above 49.0 percent three times since the end of his first-year "honeymoon" period. The first was in February of 2011, riding a wave of approval after Congress actually got a few things done. The second time (May of 2011) can largely be discounted, because it was merely a gut reaction to the killing of Osama Bin Laden, which quickly faded. The third time was last month. 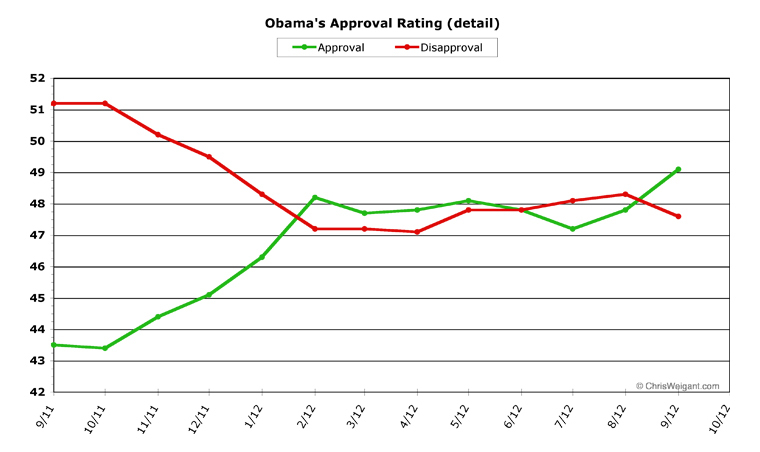 Obama hit another milestone as well in the daily approval rolling averages. For two days, his approval poll average was exactly 50.0 percent, which he hasn't seen for a single day since the Bin Laden bounce. Since February, for seven straight months, Obama has been locked in a very tight place in approval and disapproval numbers -- both of which fluctuated only within a single percentage point's worth of difference. Obama, last month, finally broke out of these doldrums, and moved the graph in a more significant way than we've seen for quite a while. At least, on approval -- the disapproval numbers would normally have fallen off to a greater extent, but as we approach the election, fewer and fewer voters are undecided. From the main chart at the start, you can see that the undecided number has fallen to the lowest level ever -- only 3.3 percent. This is (roughly) a little more than half of the usual level. The daily chart is equally as dramatic. 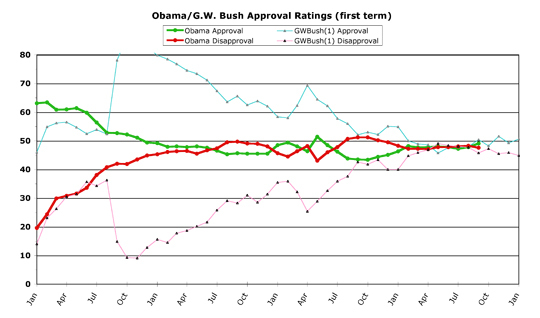 Obama's rise began right after the convention, and he logged approval of over 49 percent for the rest of the month (excepting the final day). Pretty much since February, Obama has switched "above/below water" multiple times within each month. This month, he started underwater and after the convention has stayed comfortably above. On the last day of the month, this trend reversed somewhat, however -- which does indeed strike a note of caution into reading too much into Obama's good month. October is debate month, so the numbers could indeed shift around in various ways before the election. Another note of caution is that while it is indeed good news that Obama can now reliably top 49.0 percent approval, the real guarantee of re-election is held to be numbers above 50.0 percent. This gap may mean a closer election than the trendline seems to indicate. That's pretty close -- and much closer than any other election year going back to Eisenhower. Just some final food for thought. And, to close, a program note: we will be providing one final Obama Poll Watch column before the election, but we can't swear which exact day it will appear on. Approval is not the same as likability. Approval is not the same as trust. A big reason why the pundits are dumbfounded that the economy is not crushing a sitting president is that, while the public may not approve of everything he's done (and there's plenty to disapprove of), a clear majority both like and trust the President, and believe that he'll try to do what is in their best interest. There's speculation that Gov. Romney is going to try to present himself as though he cares about the common citizen. Not only do people know he really doesn't, many don't like it when a patrician -and, even worse, a plutocrat- tries to pretend he does. If all MR is bringing to the debate are anecdotes of the Little People from the Campaign Trail, it's going to be an uncomfortable evening. There was a time that the Democrats didn't really take voter suppression seriously. I don't think they believed in their hearts that anyone would have such depraved contempt for the root of the American system as to attempt to put systemic suppression in place. But the decade after Bush v Gore, characterized by shameful, targeted redistricting, that made the venerable partisan traditions of gerrymandering seem egalitarian in comparison, turned on the lights. First by observing the feckless neo-cons in their transparent deceptions in the run-up to the war, and finally understanding the methods and the goals of those more sinister like Rove, it became clear. Polls wouldn't count for much if the majorities represented in the polls couldn't vote. In that way, it's far better than it was, and a far bigger nightmare for ol' Karl and his cronies. 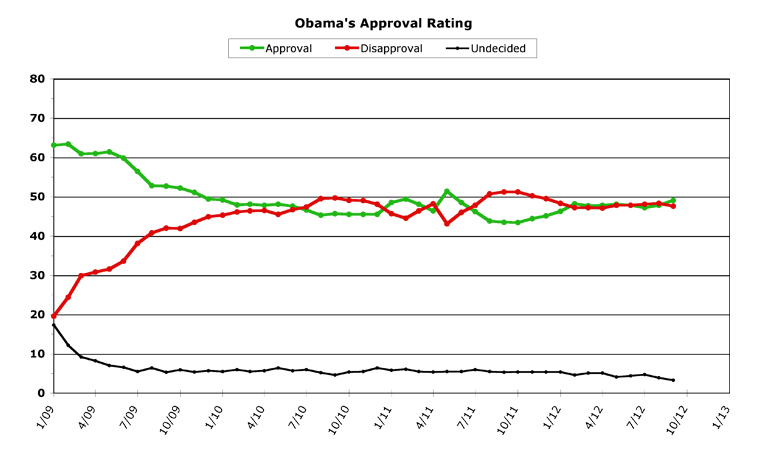 Which is a big reason why Obama is doing so well in the polls just now. A good debate tonight and solid job numbers on Friday, then this thing is over. Incredibly slow day, this. The "game changer" is repudiated and the purveyors mocked; half life was not even a full cycle. Mainstream is trumpeting a tightening race, as do the commentators during halftime of a Superbowl (the other Superbowl, the football one) when it looks like the game is slipping out of competitiveness and they fear the viewers will tune out and head for the guacamole. I'm going to watch the debate, the way I always do: with the sound off. Debates aren't about information; formats are designed for sound bites. The only thing they can't control is the gestalt. The pundits, for some reason think it's about information or about some Hostess packaged sweet alternative to Twinkies: Zingers. Americans watch debates like poker players watch the others at the table; they look for the tells. And, in a debate, I'll say to the pundits: if you can't find the stiff in the room, it's you. romney won the debate, by a lot. not that i'm particularly pleased or disappointed, but that's what happened. any thoughts on how (if?) the debates will impact the polls and the election? Or seniors, for that matter. I've always thought the blowback for the voter suppression thing will take place among seniors who are denied their right to vote. They'll be life-long (for howeverlong that means) Democrats as a result.